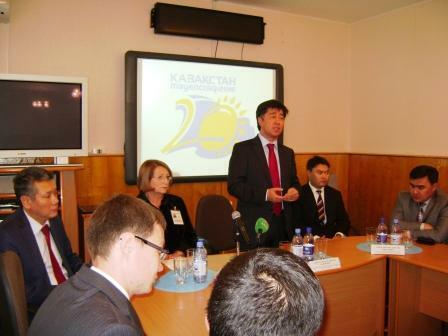 "The regional center for training and retraining of civil servants government Kostanay region"
On 10 July 2013 the Regional centre held a round table on the topic "Experience of using interactive technologies in the educational process". In the Regional centre of retraining since June 10 2013. two workshops are working: for retraining of civil servants - "Public Administration and Civil Service: fundamentals, principles and prospects" and a seminar on professional development - "Strategic Planning in the Republic of Kazakhstan: Assessment the effectiveness of government agencies. " 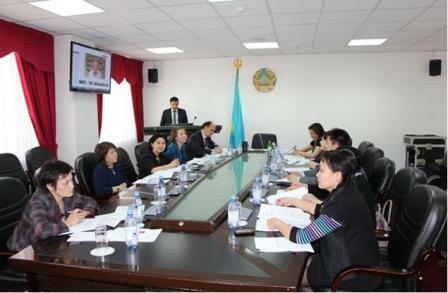 On 05.06.2013 during the seminar "Public procurement in the public financial management" there was held a Round table "Preventive methods for elimination of corruption offenses in the public procurement system of the Republic of Kazakhstan». 03-07.06.2013 the Regional Centre of retraining and advanced training of public servants hold the seminar "Public procurement in the public financial management." 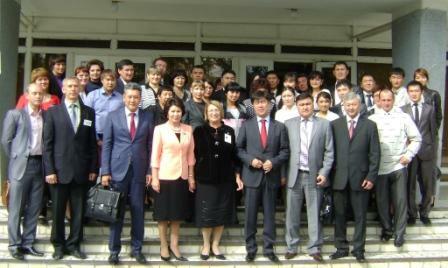 With seminar "Modern technologies of preventive public policy in Kazakhstan. Managerial and leadership competence in public administration "
Seminar: "The concept of social modernization in the Republic of Kazakhstan. Strategy for employment and social protection of citizens. Labor legislation "
Regional Centre participated in an online conference which was held by the Academy of Public Administration under the President April 30, 2013 in the international communication platform «G-Global» in the «VI Astana Economic Forum and the World Anti-Crisis Conference"
Seminar on "Ethics and the image of a public servant. Business communication, mediation of speech in a professional activity "
Seminar on "Industrial and Innovative Development of the Republic of Kazakhstan. The industrialization of agriculture "
Seminar: "The official language of the state body. EWSS. Organization of control over the execution of orders "
Seminar: "The concept of local self-government. Legal support of the mayor of the rural district "
Seminar on "State program on development of the Republic of Kazakhstan regions." International Conference SOE "Regional Center retraining of civil servants" AKO and Lugansk Center of Postgraduate Education on the theme "Working with families who find themselves in difficult family situation,"
Seminar on "Financial management and the basis of external and internal controls. IFRS ". March 4, 2013 at the Academy of Public Administration under the President of Kazakhstan passed the Republican scientific-practical conference "Strategy" Kazakhstan - 2050 ": improving the training and development of scientific research in the public service"
Seminar on "Modernization of public administration in the Republic of Kazakhstan"
Seminar "Modern information technology in government. Saitostroitel'stva "
Seminar on "Modernization, housing development. The development of company towns. An energy management system. " "The personal creed of every citizen of Kazakhstan should become a" learning throughout life ""
December 20th Regional Centre celebrated 10 years . During this period, the center raised their qualifications 11861 public servant. Conducted 438 workshops. According to statistics, over 10 years, every public servant Kostanai region to enhance their skills in an average of 3 times. The regional center is the only one in the Kostanai region, where the training of civil servants of all the cities and districts of the region. Professionalizing the civil service, the formation of a strong corporate culture, improving the ethical behavior of public servants are defined by the Regional Centre of trust indicators in the implementation of the concept of the new model of public service, adopted July 21, 2011. Our regional center focuses on modern methods and forms of adult education, which, along with the traditional practice of interactive teaching methods: presentations, training sessions, role playing, brainstorming, Oxford debates, panel discussions, visits to cultural centers of the regional center. As part of the refresher course provides training in the provincial departments and offices, which allows more detailed acquainted with the work of state institutions. The regional center has a modern material and technical base, equipped with a computer and copying equipment, video-audio equipment, interactive whiteboard that allows training to a new level and to increase the effectiveness of the lectures. 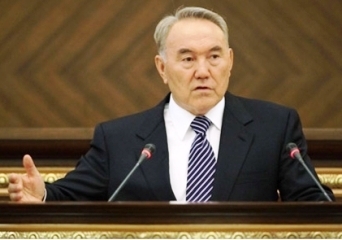 The regional center uses in the program developed by the Academy of Public Administration under the President of Kazakhstan and adapted to regional conditions. Classes at the Regional Centre are highly qualified professionals: academics, officials from the office of mayor, heads of committees, regional offices and departments and the center staff, many of whom are doctors and candidates of sciences, academicians and professors. Our teachers improve their skills in A Kadem state udarstvennoy service courses conducted by the Soros Foundation-Kazakhstan, the International Association of Managers of the cities, the Eurasian training center for civil servants and abroad - in Hungary, Spain, Poland, Germany . We thank everyone for their assistance in the development and establishment of the Regional Centre and look forward to further fruitful cooperation and interaction with teachers and with government agencies Kostanai region.